Rain's Garden: Strawberry Ice Cream! Cats & Dogs, More Quiche, Can You Identify My Flower??? Strawberry Ice Cream! Cats & Dogs, More Quiche, Can You Identify My Flower??? I started to put my Ice Cream recipe book to good use yesterday! 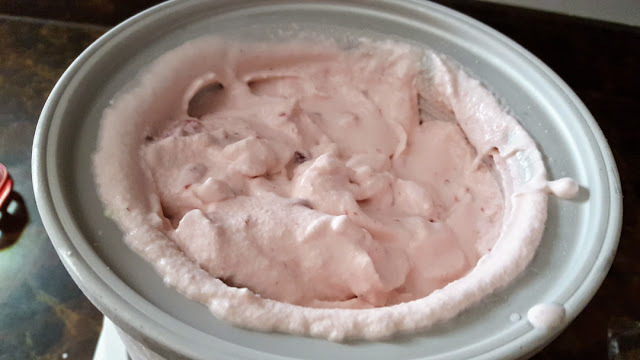 I made my first Strawberry Ice Cream. Strawberries are local and freshly picked for the next few weeks, so I'm loading up because they are so sweet! The imported/frozen variety I'm stuck with all winter does not compare so I may invest a lot of money to freeze these sweet ones for the winter. 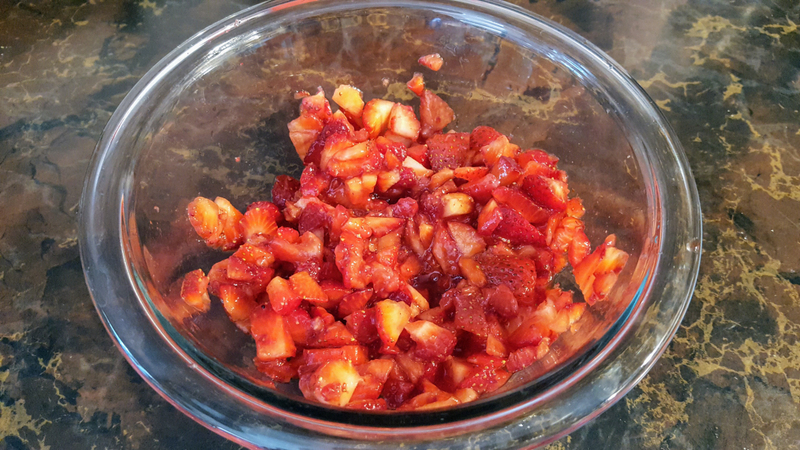 The recipe calls for 2 cups of strawberries all mashed and chopped up. Cream, milk, sugar, salt and vanilla are the only other ingredients. I bought myself a Cuisinart Ice Cream Maker about ten years ago on a whim. 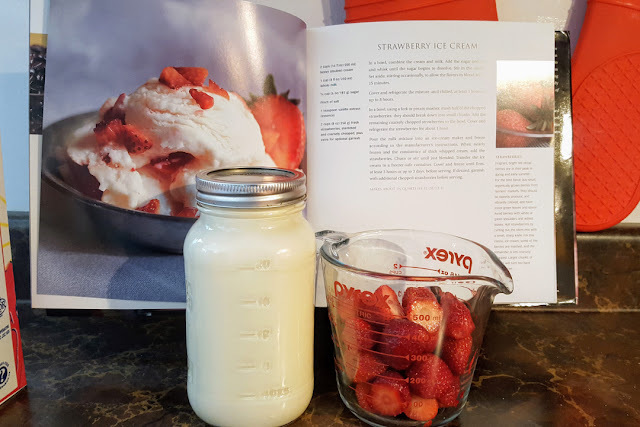 I used it a few times to make sorbet but this is my first real attempt at ice cream and the results were so amazing! I'm sure there are ways to make ice cream without the Ice Cream Maker, but I think Google would know more about that than I would! The ice cream was super delicious! It was ready in time for dessert last night. The only thing is that the berries were so frozen that it actually made our teeth sore to chew them! Next time I'll use the juice and discard the solid part of the berry for something else. I'll add some fresh strawberries at the end. 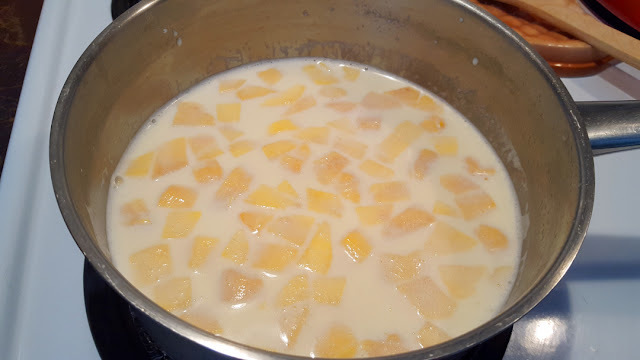 I was so pleased by the results that I already started the Country Peach Ice Cream recipe! This one is a little different. You make a custard first, then let it sit in the fridge 24 hours and put it all together. But I'll blog about that one next time! The peaches come from the States so unfortunately for export, they pick them before they're really ripe so they'll last longer during shipping. This makes the fruit not very sweet to begin with; and with no way to really ripen them properly, so I don't know that this one will turn out with a nice peachy flavour. I wish I could get more local peaches. The Ontario ones come in July if I remember right, so I'll just be patient! 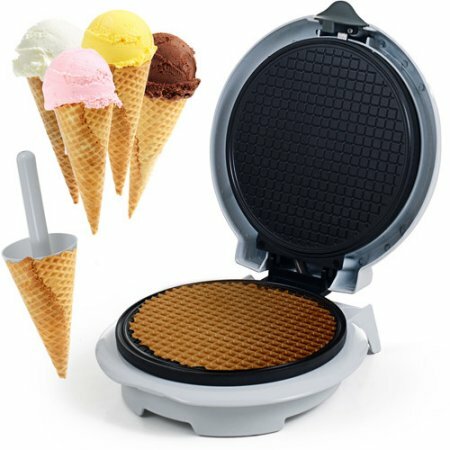 These waffle cone makers are neat, that's for sure! But I'm not quite willing to spend $60 right now for a "toy" that can only do one thing!!! Maybe "Santa" will bring this to me because HE LOVES waffle cones so much! Cats and Dogs...The three big dogs are always out in the yard, but the cats and Jack stay inside most of the time. I don't know what is up with Jack, he just doesn't like to be outside, even in nice weather! The little ones stay inside. Mmm...mmm.mmm...Asparagus and Old Cheddar Quiche...need I say more? 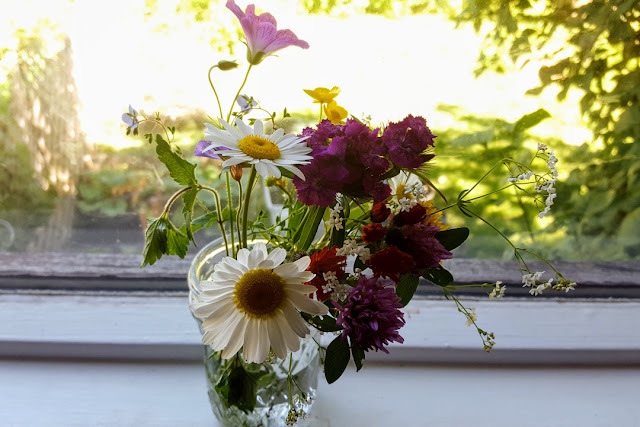 I got spoiled with another bouquet of wildflowers yesterday! :) We've identified all but one flower. So I need help from my Blogger friends please. Look at these beauties! This is a good example as to why I adore Nature. I have never seen such a lovely design before. Alex found these growing under one of the cedar trees. One patch of them. I did so many searches for various "colour" flowers with "x" petals and dots, spots....just cannot identify them. You can always click on the pictures for a bigger view. Any ideas? My guess is a dianthus, or more specifically, sweet william. My wife is good at identifying plants and flowers. She also thinks it's dianthus, in the same family as carnations. Really lovely thoughts and photos. I am no good at identifying such. Warm greetings and best wishes! You had me at ice cream :) So much good food here! The flower looks like my dianthus. that quiche sure looks good! i am an ice cream hater. i just can't stand the stuff. 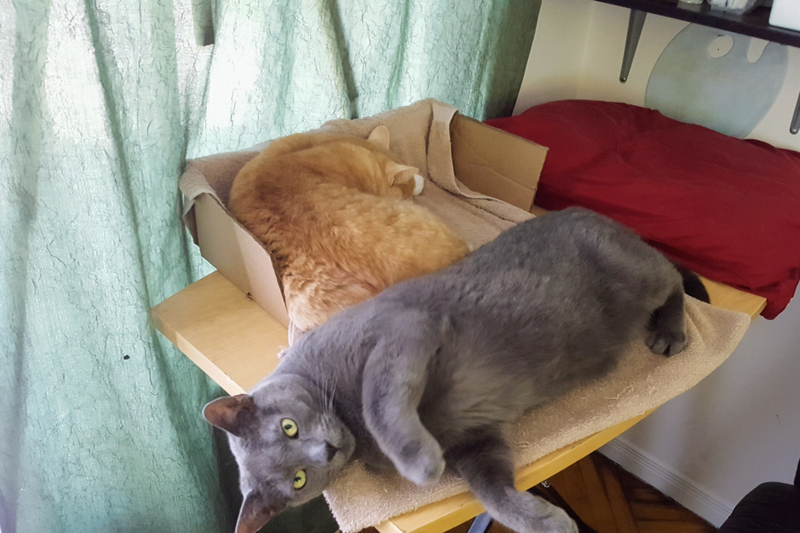 my husband on the other hand does not share my problem. Bless your heart! 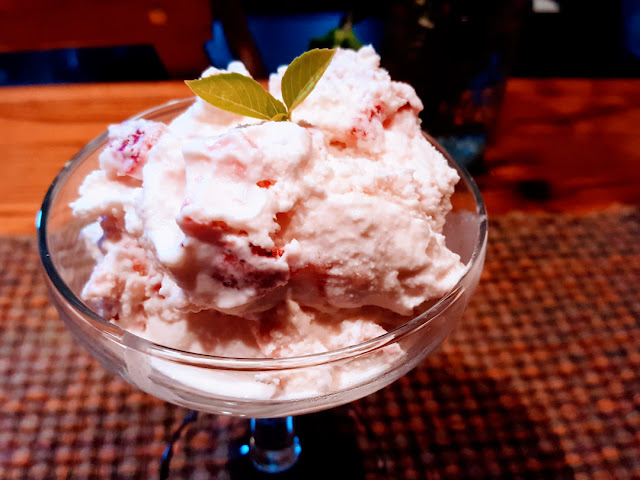 I was trying to come up with new ideas for using up my bumper crop of strawberries - ice cream~! I have the same ice cream maker (love it) and this is just the ticket! 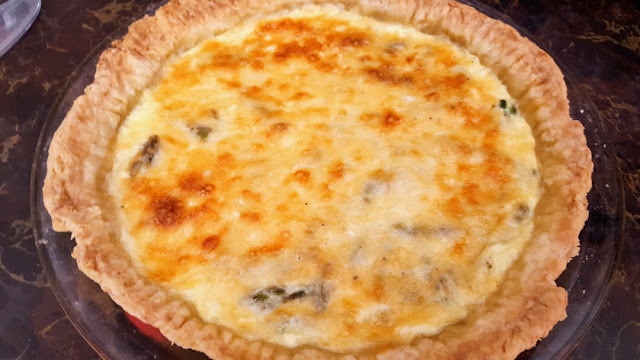 Your quiche looks delish! That reminded me, my mom gave me an old ice cream maker! I should put it to use. 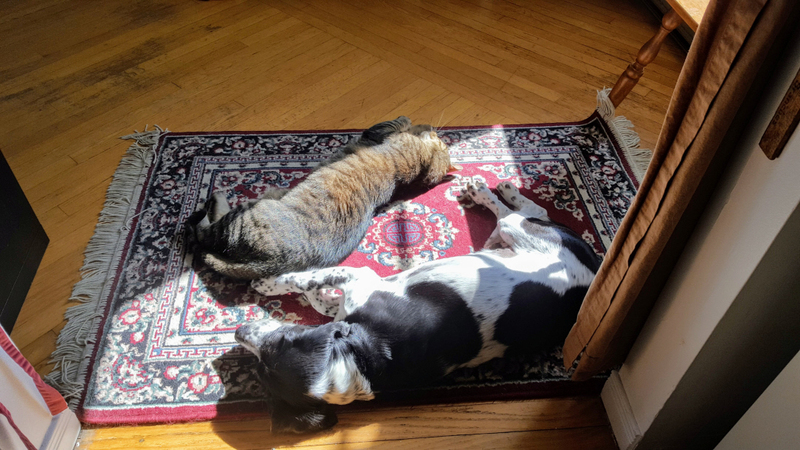 Doesn't sleeping in a sun beam just seem so lovely? I also like moonbeams. Oh that ice cream looks divine!!! Can you do frozen yogurt too? Our Tucker is the same way, he does not like to go outside at all. And if its raining, forget it!!! He's slightly stubborn that way and we have to get firm with him to go outside to go to the bathroom. I concur with the others, dianthus! I have a bunch in my front garden. Love them! They are a favorite of Tasha Tudor - one of my heros! We are pouring down rain. Of course. I hope you have sun! Oh, that yummy looking ice-cream! Everything is looking good, Rain. I agree with the other bloggers, your flower is a dianthus, although which one I don't know. They have lots of names, one I think is named, 'strawberries and cream' but other names are more old-fashioned, 'Doris' and suchlike. 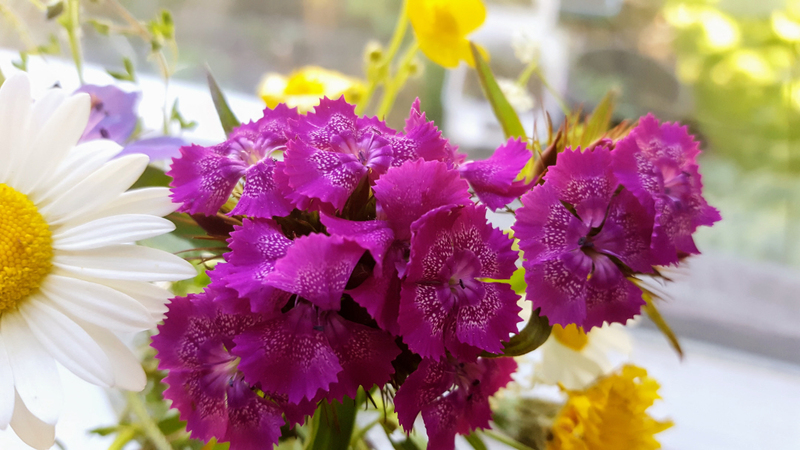 Thanks for everyone's input, it seemed easy for everyone to identify the flowers as Dianthus!! I had never heard of them before! Thanks Diane :) I looked up Sweet William, they're so pretty. Thanks John :) I love carnations too. I'll have to look for more of them in the yard. I've never seen such a pretty flower before! Hi Debra :) Thanks for the link! I just checked out Suzie's malted chocolate ice cream post!!! Hi Blogaratti :) Thanks for the comment, I had no clue what the flower was either! Hi Snoskred :) I'm happy to know it's a perennial! Hi Jenn :) I think you should put that ice cream maker to good use!! I have recipes for sorbets, granitas and sherbets too. I love moon beams too! :) But honestly, I could use more sun beams, I'm really missing a nice summer this year! Oh, Jack won't "go" if it's raining either...he'd rather hold it in all night, but I take him out a few times until he gets the message that he isn't coming in until something happens lol...sun and rain mixed ALL the time, it's starting to get a wee bit depressing isn't it? I just looked up Tasha Tudor, she looks like a lovely woman, I'm going to read up on her a little bit! Hi Rosemary :) Thank you! The strawberry and cream dianthus is so pretty, and it really does look like a carnation! I wish I knew a little more about flowers, but for now I'm concentrating on the veggies!! :) One day I would love to have a set up like yours!! Hi Sis :) I still have to post about that country peach ice cream!! Things have been busy around here too, but we're having a good time :) Mostly eating lol...I'm lucky that Alex has that romantic streak in him, I love when he surprises me with flowers, but we have to keep them on the porch now so Leo doesn't eat them! !